Continuing a long-standing spectacle unique to the Daytona Speedweeks, 2012 NASCAR Sprint Cup drivers and teamed suited up to the only qualifying heat races on the series' schedule. With only the top-two spots for the Daytona 500 secured after Sunday time trial, the filling of 41 remaining positions would be resolved through a pair of 125-mile, 60-lap races. Dividing the Sunday qualifying field in half, pole winner Carl Edwards would lead race 1 for odd-numbered qualifiers while Roush Fenway teammate Greg Biffle had the top starting spot for race 2. 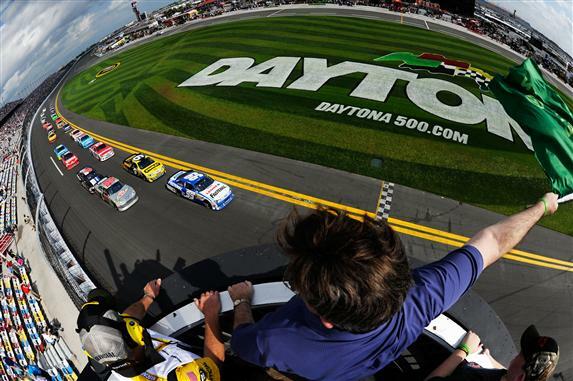 Following the Budweiser Shootout hosted at the Daytona International Speedway the previous Saturday night, a preview for the type of restrictor plate racing indicated drivers would need to reacquaint themselves with multiple-car packs. After spending 2011 experimenting with the two-car tandem drafting, NASCAR teams would be held in tighter quarter racing. Making for a more wide-open race where any driver with momentum could find their way to the front, pack racing also decreases the tolerable margin of error between competitors. The side effect of pack racing was shown at least three times in the 2012 Budweiser Shootout with major, multi-car wrecks. Some observers speculated NASCAR Sprint Cup series teams may have received new regulations in reaction to the sometimes wild racing. Allowing teams to increase the engine water pressure check valve from 25 PSI to 28 PSI, NASCAR made no other changes to the sporting rules heading into the Gatorade Duel 150s. Races mixed with well-established teams and veteran drivers, first time Daytona 500 runners and teams outside of the top-35 needing a strong run simply to make the Great American Race Sunday, there was a total of 49 teams intent to compete at the 2.5-mile oval;s 43-car event this weekend. The last non-points competition to involve NASCAR Sprint Cup drivers ahead of the official start of the 2012 season with the Daytona 500, the Gatorade Duel 150s were staged Thursday as an important event for all drivers. Daytona 500 pole sitter Carl Edwards led the 25-car field to green Thursday in the first Gatorade Duel 150 event. Edwards' #99 Ford Fusion led the first of 60 laps but was soon overhauled by Tony Stewart's #14 Chevrolet. By lap 5, the Hendrick Motorsports #88 Chevrolet driven by Dale Earnhardt Jr stormed to the top spot. Historically regarded as the qualifying race containing the most cautions, the first Gatorade Duel 150 event for 2012 Speedweeks at Daytona International Speedway delivered on yellow flag expectations. A four-car incident in turn 1 on lap 10 when the #38 Ford of David Gilliland was poked by the #98 machine driven by Michael McDowell. Gilliland's car continued a path up the 31-degree banking collecting the #42 of Juan Pablo Montoya and Paul Menard's #27 Chevrolet. David Gilliland, Juan Pablo Montoya and Paul Menard were out of the race due to significant crash damage. Following the major accident, the first Gatorade Duel 150 stabilized with Joe Gibbs Racing driver Denny Hamlin taking the lead of the event at lap 17. Driving the #11 FedEx Toyota, Hamlin led 27 laps of the Duel 150 event. Attempting to make the 2012 Daytona 500, two-time winner of the biggest NASCAR Sprint Cup series race Michael Waltrip was feverish in his efforts to make his 26th career Daytona 500-mile race. Unfortunately, a lap 54 incident ended his plans of making the 2012 race with the #40 Toyota. Leaving pit road after making a needed fuel stop, Waltrip miscalculated his reentry onto the Daytona race track. Combined with the likelihood of debris on the lower track surface, Michael Waltrip lost control of his Toyota race car crashing it into the outer backstretch wall. Following the failure to quality for the Daytona 500 in 2012, Michael Waltrip responded through team media "I just went the wrong way and lost the car. I feel like I let everybody down. I raced my way to the front and then I let them down. It's just really hard. I don't know what to say -- it's just sad.". Setting up a 4-lap rush for the finish, the #14 car of Tony Stewart led the NASCAR Sprint Cup group to the final run to the checkered flag. Dale Earnhardt Jr, Jeff Burton and Marcos Ambrose made the race interesting at the end coming down to the final lap. However, the race would conclude out of turn 2 when the #43 Ford of Aric Almirola made contact with Danica Patrick's #10 Chevrolet. Sent for a fast, violent ride, Patrick flew into the lower retaining wall. Fortunately unhurt, Danica Patrick's first Daytona 500 will have her starting the Stewart-Haas Racing team car deep in the field. 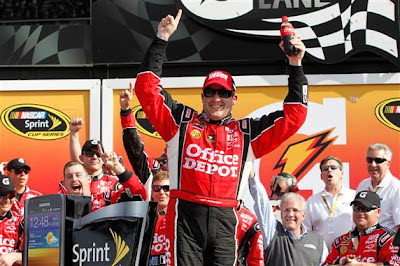 Under the protection of the yellow flag, Tony Stewart cruised to the start/finish line for the first Gatorade Duel 150 event with Dale Earnhardt Jr following in second place. Marcos Ambrose, Jeff Burton and Carl Edwards rounded out the top-5. Under the guidance of 2012 Daytona 500 front row starter Greg Biffle, the second Gatorade Duel 150 qualifying race. Unlike race 1, the second Gatorade Duel 150 event ran without the appearance of a yellow flag. The result in this second race was a more methodical competition where NASCAR Sprint Cup drivers carefully made their moves through the field. With a Roush Fenway Racing Ford leading the event early, race 2 for the Gatorade Duel 150 would show some impressive pace for the Ford Fusions. Between Greg Biffle and Matt Kenseth, 50 of the 60 race laps would be led by the Roush Fenway Racing organization. Leading for five laps apiece, the Joe Gibbs Racing Toyotas of Joey Logano and Kyle Busch would the only vehicles able to compete with the Ford brigade. After having his Sunday qualifying time disallowed when the #15 5-Hour Energy Toyota failed to meet post-qualifying inspection, Clint Bowyer fought hard through the Gatorade Duel 150 round to make up positions. Taking his Michael Waltrip Racing car near the front early in the event, Bowyer's efforts were hindered by engine overheating problems. Costing him a lap in the qualifying race, Clint Bowyer could not obtain a spot better than 15th place. Maintaining a single-file drafting train in the final laps, the #16 Ford of Greg Biffle was the top driver. Coming to the white flag though, Biffle's teammate Matt Kenseth made a run on the #16 car along the outside line of turn 4. Getting a push from Jimmie Johnson, Kenseth rapidly roared up on Greg Biffle resulting with the #16 Ford to veer into the path of the #17 teammate. Attempting to hold off Kenseth, Greg Biffle lost momentum causing Matt Kenseth to pass the #16. On the final lap behind Kenseth's #17 Ford, there was contact between the #78 Chevrolet of Regan Smith and Jimmie Johnson's #48 Chevrolet through the Daytona superstretch. While there was a brush-up between the vehicles, both Chevys raced to the finish. 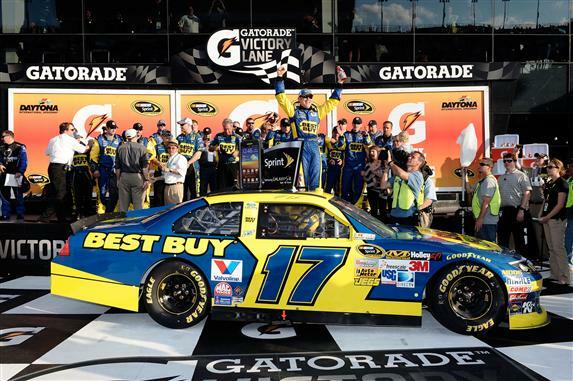 At the finish line, Matt Kenseth pulled off a Gatorade Duel 150 victory over the #78 of Regan Smith. Jimmie Johnson, Elliott Sadler and Greg Biffle finished 3rd through 5th in this second qualifying race.